Ok. I am ashamed of self. I've been lazy about blogging my latest projects and adventures. My pictures are at home, but every time I go home I start watching What Not to Wear and eating from the massive bag of candy my sweet hubby gave me for our 6th anniversary :) Every year we give each other the traditional anniversary gifts - this year was either iron or candy. I made him a batch of homemade marshmallows (pictures coming! ), and he got me a big ole bag of my favorite candy from Dylan's Candy Bar (Ralph Lauren's daughter runs this cool place). YUMMERS! So while I get the old fanny in gear, I want to share with you a mighty goal which I will soon aim for. 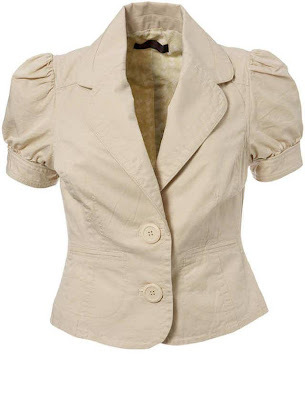 Alrighty now - this little number above is the result I would like to get after refashioning a J Crew jacket I have and hardly ever wear. I tried to find a picture of it online, but sadly it is out of fashion already - boxy, 3/4 length sleeves with a single button closure. My plan is to adjust the fit of the body so it's cute and tailored (me being the tailor, I don't know if that's a good thing or not), then completely remove the sleeves, cut them into puff sleeves, and sew back on. Mmmm. This is a hefty project, but I think I'll be able to do it. I can feel the obsession starting....t'won't be long now before I'm lost in the furvor that is (dum-dum-duuuum...) the puff-sleeve jacket! Ooh! What fun! WNTW, candy, sewing!! I can't wait to see your finished project, and homemade marshmallows?! I can't wait to see those either!